For nearly 35 years, the University of Missouri–St. Louis College of Optometry has been serving the public through its three premier eye health clinics. Now, UMSL Eye Care hopes to increase the breadth of its patient community by raising the visibility of its patient care service locations with a marketing campaign. The outreach includes a new website, a billboard campaign, window clings and radio spots read by KMOX’s Carol Daniel – all designed to build awareness of the excellent care available to the St. Louis area community. At UMSL Eye Care, both the general and university communities and students receive symbiotic benefits. For patients, optometrists provide superior care in a professional setting. Simultaneously, the student doctors obtain real-world training while under the supervision of licensed clinicians. In addition to exemplary and comprehensive adult and pediatric eye care, the centers provide a variety of specialty services such as low vision rehabilitation, treatment for binocular vision and nonsurgical vision options. Many of the center’s clinical providers are known internationally in specialties including cornea and contact lenses and management of eye abnormalities impacting children. 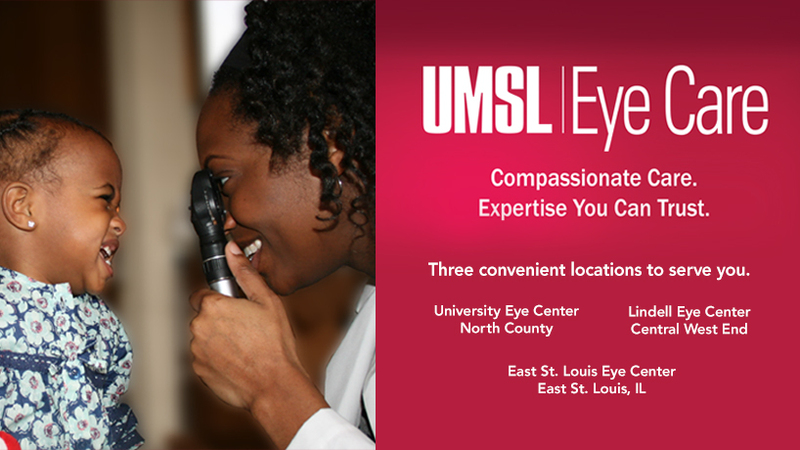 UMSL Eye Care accepts most medical and vision insurance plans and has an extensive contact lens and optical dispensary. The campaign and website came from a collaboration between the College of Optometry and University Marketing and Communications. Assistant Director of Clinical Operations Angel Forsha and the marketing team started by rebranding the patient care umbrella organization, which they changed from the UMSL Center for Eye Care to UMSL Eye Care. To drive home the point that the centers are open to the public, the team included the messaging, “Three convenient locations to serve you.” Together, they strategically placed billboards in the neighborhoods adjacent to Lindell Eye Center in the Central West End and University Eye Center in Normandy. The latter is located in the Patient Care Center, which also is home to an SSM Medical Group office. To differentiate the professional patient care services from the school, the web team built a site for UMSL Eye Care from the ground up. They also developed an easy-to-remember URL: eyecare.umsl.edu. Formerly, the patient care pages were folded into the college’s academic site. Forsha has already noticed an uptick in interactions as potential patients contact the front desk through the website. In the near future, she’ll be adding an online portal, where patients will have access to their prescriptions and health history. She sees the patient portal as a potentially transformative time saver and hopes that, along with the campaign, it will allow the centers to provide more peerless service to the community.